The IDF announced that the 'Namer' APC has received a serious upgrade, with a 30 mm cannon added to improve its urban warfare capabilities. 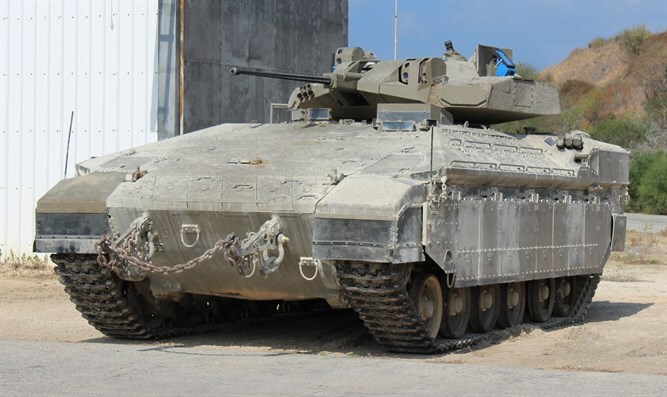 The IDF's Ground Forces Command and the Merkava Tank Division of the Defense Ministry announced that the 'Namer' Armored Personnel Carrier (APC) will be getting a 30 mm cannon, and has now reached the experimental stage. The move is part of an IDF's effort to upgrade its urban warfare capabilities. Unlike the Merkava Tank, the cannon in the Namer (Hebrew for "leopard") will not require a soldier to operate it while standing in the turret, freeing up space and enabling the APC to transport more soldiers. The gun is controlled by soldiers riding inside the belly of the Namer, with the aid of video cameras. "An APC containing a turret and cannon gives it a advantage during urban warfare" said Colonel Baruch Matzliach, who runs the Defense Ministry's Merkava tank development program. "The shortened cannon makes it more maneuverable, and [gives it] the ability to provide firepower to infantry soldiers. It also lets infantry soldiers be more independent on the battlefield, with less dependence on other units to provide firepower." The cannon was added to improve the Namer's urban warfare capabilities, something that the IDF attached top priority to after 2014's Operation Protective Edge. Another APC, the 'Eitan', was introduced in July 2016, and is considered more maneuverable in urban warfare settings due to its having tires, as opposed to the more common tank treads.